Born on one of the outlying planets of the Eared Empire, Khan knew from a young age that he was destined for greatness. In his youth, however, he was a bit wayward and ran into trouble with the law. After a number of odd adventures, however, he became much more focused, deciding instead to become a more or less respectable businessman. Khan founded Khan Industries, a company known for their spelljamming ships and also their weapons manufacture for said ships. The company produces what are widely agreed to be some of the finest ships created by a large manufacturer (as opposed to single independent builders, for instance). Khan also employs numerous independent contractors who work as delivery agents for supplies: most agree that if you want a valuable package to arrive on time, Khan Industries is the way to go. Irked by ever-increasing regulations and limitations imposed by the Empire, Khan eventually relocated his business to the free city of Traverse, specifically the orbiting asteroid known as Cape Suzette. There, he enjoys a certain degree of freedom from Empire law, while still able to sell his ships right back to them. 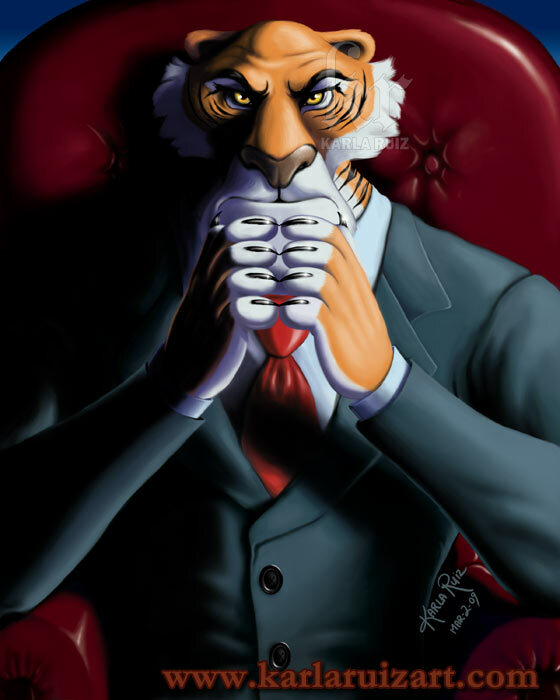 Shere Khan is absolutely ruthless and extremely pragmatic in his dealings, but he also adheres to a strict code of honor and is eminently fair in all his dealings. He will never go back on a deal or alter it without the consent of those bound to a contract under him, and he always pays his debts. On the other paw, he isn't at all tolerant of laziness or incompetence, and the Light preserve you if you should ever betray him. Shere Khan often hires adventurers for various tasks, usually when he needs a little extra muscle. Payment is usually finder's rights for whatever lost ruin they're exploring, though if adventurers find nothing and it is demonstrably not their fault he will provide compensation for their time and any equipment used. He also usually allows adventurers use of some of his company resources for whatever tasks he sets them to. Billionaires do tend to take up rather odd hobbies (such as diving into moneybins) and Khan is no exception -- he collects deadly and exotic plants, and fills the common areas of his office building with them. Khan is an expert on the care of carnivorous plants, will never be targeted by the ones in his building. Guests and employees are always warned never to approach the flowerbeds, and he keeps particularly dangerous specimens behind fences... but it also gives him an easy way to deal with betrayers. Finally, Khan maintains a more or less friendly rivalry with Scrooge MacDuck. The rivalry is friendly primarily because Khan doesn't see MacDuck as a threat. Khan's ships are quite different than the ships of the Empire; while Empire ships tend to be ostentatious spun sugar creations, Khan ships resemble nothing so much as aircraft of the 1930s and 40s. He's quite silent on where he got the designs. Khan actually owns his own private fleet of cargo and fighter aircraft. The cargo aircraft are part of his private shipping and transit services, whilst the fighter aircraft constitute his own personal army.